My work is a marriage between traditional techniques and modernist aesthetics. I use traditional forms and techniques while applying minimal amounts of bright color. I draw inspiration from traditional Japanese ceramics as well as modern furniture and architecture. I use the contrast of loose, layered surfaces and sharp bold sections of color to create a composition on the pot. 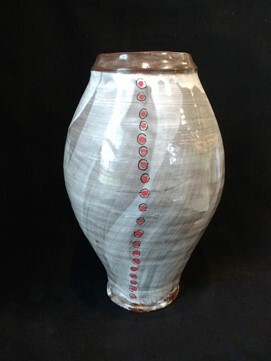 My ceramics are functional forms that are fired to cone 6 at 2200 degrees in an electric kiln. My work is thrown on a wheel or hand built using a porcelain type clay. I then apply a black terra sig over it. Then apply a white slip over that. Finally I add different colored of underglazes onto the pot. After this the piece gets a clear glaze to seal the clay. My work is food safe, dishwasher safe, and hot liquid safe.